Map Type "North Pole" and "South Pole" are now available. The SELENE Data Archive will be closed at 12:00(JST) on September 29th, 2017. Kaguya data will continuously be provided on the SELENE Planetary Data System (PDS) site and this site (KADIAS). We hope that Kaguya data contributes to your research and activities ongoingly. KADIAS is now reopened with the following products after the error had been corrected. Thank you for using KADIAS. Because trouble was found in the data posted on KADIAS, we will temporarily stop providing the service. We will inform again as soon as details become clear. We apologize for any inconvenience caused to you. KAguya Data Integrated Analysis System (KADIAS) is now open. [Notice]Due to maintenance, "Analizing Tool" is unavailable now. [Notice]DNS records will be updated between 10:00-12:00 on Aug. 28 (JST). If KADIAS dose not work properly, please resume from the top page. [Notice]This site is available now. [Notice]We will resume publication of the following products. We will resume publication of the following products. We found incorrect one pixel(*) shift to northwest direction in all products except Scatter(SP) and Radargram (LRS). In order to rebuild these data, we postpone resumption of the KADIAS service. We apologize for the inconvenience and would appreciate your understanding. We found errors of location in North/South Pole Map type display and in downloaded GeoTIFF data. Also, we found miscalculation about spatial resolution for downloaded image products. Therefore users cannot obtain above data of intended location and resolution from the KADIAS. We will fix them by February 6. Therefore users cannot obtain above data of intended location from the KADIAS. We will fix them by the end of January. [Notice]Due to maintenance, it may take time for respounce between Jan. to Feb. 2017. Adobe(R) Reader(R) is required to browse this web pages. 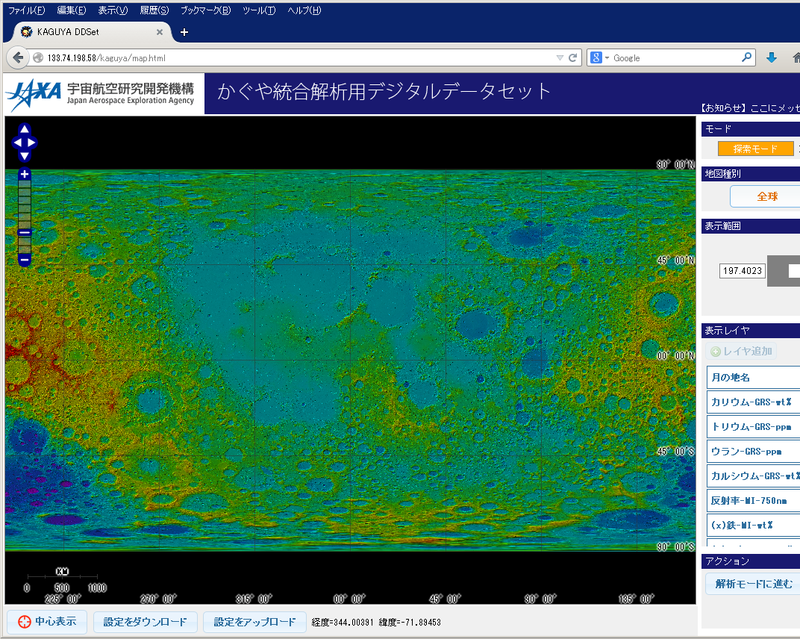 KADIAS（KAguya Data Integrated Analysis System) provides the WebGIS(*)-based analysis and download functions for observed data obtained by Japanese lunar exploration orbiter SELENE/KAGUYA. This system is meant for users who wants to integrate various SELENE/KAGUYA products and also easy on beginners to handle this system. Please be aware in advance that: Although JAXA has taken every care to manage the Site, JAXA assumes no responsibility regarding the safety of the contents of the Site or the reliability of information provided on the Site. JAXA is not responsible to you for any damage that may be caused by the use of the Site and/or the information on the Site. JAXA may change or delete the information on the Site, or may suspend or terminate the operation of the Site without any prior notice. JAXA is not responsible to you for any inconvenience that may be caused by such changes or deletion of the information, or by such suspension or termination of the operation of the Site. Unless otherwise stated, any data distributed from the Site (the "Data") and the copyrights therein are the property of JAXA and institutes to collaborate with the SELENE project of JAXA, and the Data are protected in Japan and internationally by copyright laws and international copyright treaties. The data can be allowed to use for scientific and educational utilization. Your use of the Data for business or commercial purposes without the prior permission of JAXA is strictly prohibited. When you use the Data on the Site, you are requested to indicate "(c) JAXA/SELENE" on your products. To satisfactory use all functions of KADIAS, please check the followin items. Copyright (c) 2019 JAXA/SELENE ALL RIGHTS RESERVED.